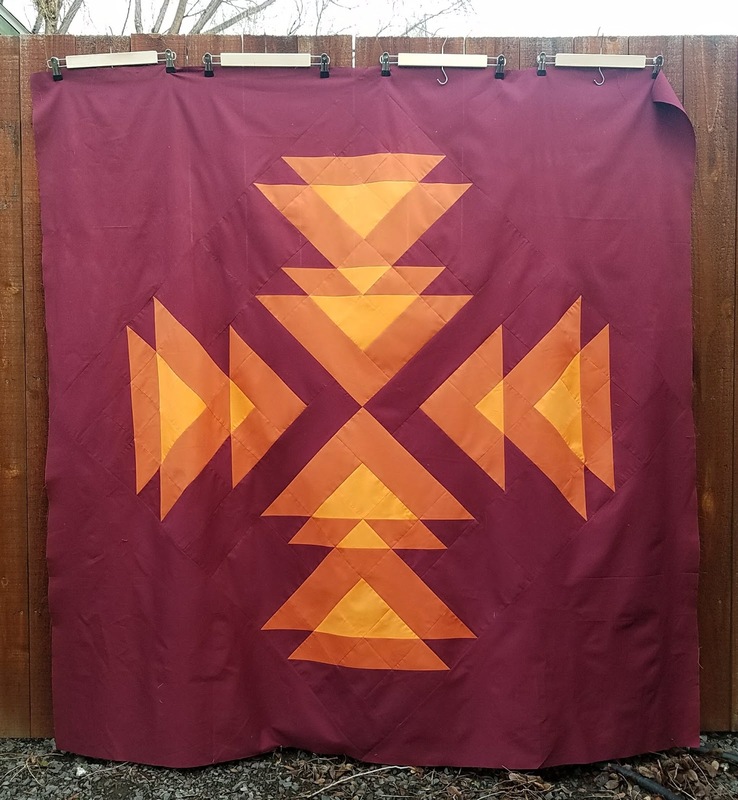 When I saw that Quilting Jetgirl was hosting the Wayward Transparency Quilt Along I was very intrigued, I love how the pattern uses different fabrics to make a layered appearance. But there were so many different color options I loved, I couldn't decide which one to pick. So I hung out for awhile in her Facebook group and on Instagram to see what color options everyone else was using. It was also difficult to decide without seeing the fabrics in person. Unfortunately I don't have any great local shopping options. 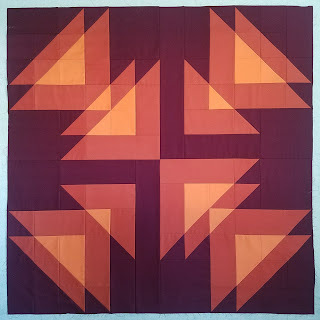 So I decided to pull out my very small solid fat quarter stash and "test" a few options before committing to the full quilt. I found a number of color combinations I liked, but not necessarily ones that gave the transparency effect. 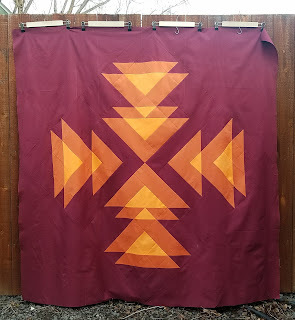 In the end, I tested the following color combo and liked it enough to buy more fabric to finish a quilt. The colors are Kona Garnet, Terracotta, and Persimmon. I realize it doesn't have the same transparency effect as some of the other combinations, but I love this colors and I'm pretty happy with how it turned out. I will say that getting a picture of the full quilt that I liked was very difficult. So I am posting a few pictures that I don't love just so there is evidence that I did in fact complete the entire top! I plan to use Garnet for the backing and binding so I don't spent to much time debating that decision. I have some Aurifil thread that matches the Garnet. I'm not sure about how I will quilt yet. 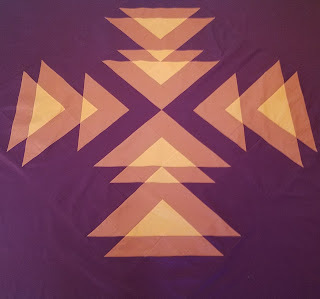 Straight lines for sure as this is what I love but I might try some triangles? Not sure yet. I have also purchased the fabric to make a purple version. Someday. And I may use this pattern to make a baby quilt. 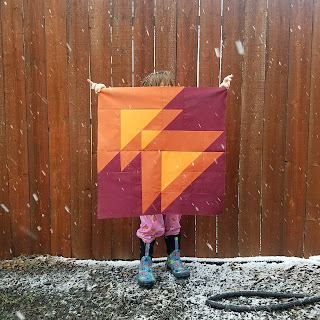 The quilt is fun to make! You can find the details about how to make your own Quilting Jetgirl website. 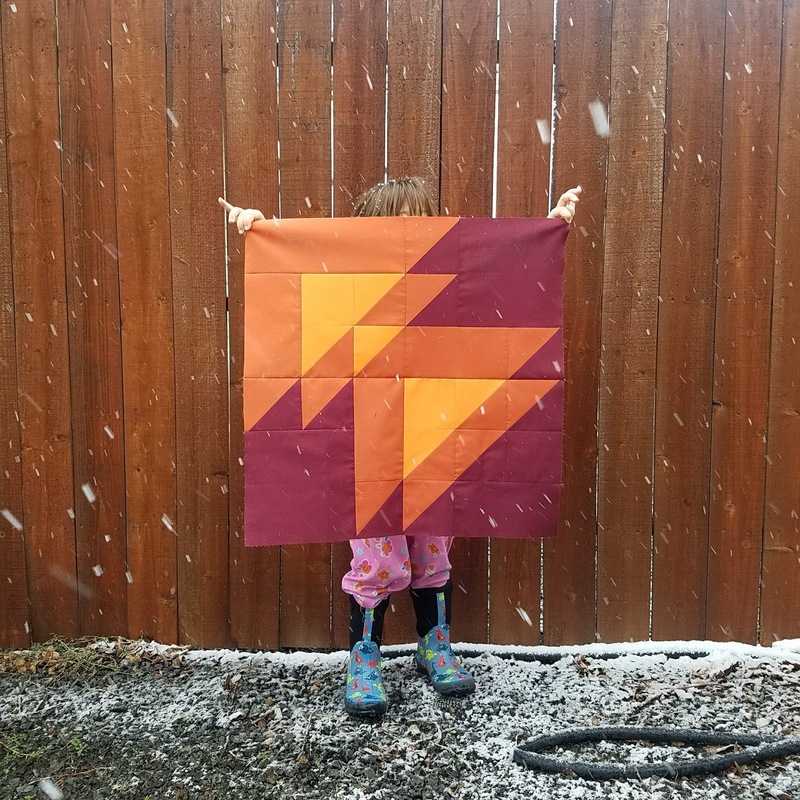 I am really glad I joined this quilt along! I think this is a stunning version, Carrie. Thank you so much for joining the QAL. When progressing around the color wheel instead of sticking with one color, the effect is different but I think beautiful in its own way. I think it is beautiful! Great job. i like this pattern and your choice of colors ! !